Together with its partners UpsellGuru, myLike, Code2Order and Selecdoo, MountLytics has created the combined "YHotel" marketing solution for hotels. YHotel centralizes all guest data into the CRM and networks all software partner. It streamlines all communication channels for hotels - without high engineering costs- along the guest's entire journey. "YHotel" is a modular software solution for marketing and customer relationship management. It combines various marketing tools in a networked software solution to automate and personalize guest communication from inspiration, booking, prior to arrival until departure. All guest data is centralized via the PMS interface in the CRM module by MountLytics . Here, preferences and messages to guests are recorded in profiles, as well as segments and email automations created. There are numerous interfaces to PMS providers available such as Protel Hotel Software, Oracle Opera, Oracle Suite8, ASA Hotel Software and MEWS Systems. New interfaces are constantly being added. The various integrated tools communicate with the guest along the customer journey. During the search process, the hotel can advertise its offers through the Selecdoo publisher network. The booking is then made directly through the hotel's booking engine. An advantage in obtaining relevant guest data. Subsequently, the hotel can communicate with its guest individually prior to arrival and sent tailored offers, such as: UpsellGuru 's Bidding System upgrades rooms and amenities to maximize the guest's stay. Before and during the trip, the guest is optimally informed. Through the features of myLike the guest receives recommendations and local experiences. The software solution "YHotel" is complemented by the module of Code2Order , a digital guest folder, to increase customer loyalty. Thus, personalized offers and evaluation links can be sent and vouchers are made available to the guest. "All over the world there are these places that make travel an experience and they want to be discovered. With the Mobile Concierge, guests will find tips that suit their tastes: trusted hotel recommendations that are better known to guests and their surroundings than anonymous Internet portals. With the YHotel, this information is now even easier, automated and personalized to the guest," said Uwe Hering from myLike. Alexander Hausmann of code2order states: "Individual stand-alone solutions offer neither the hotels nor the providers long-term added value. 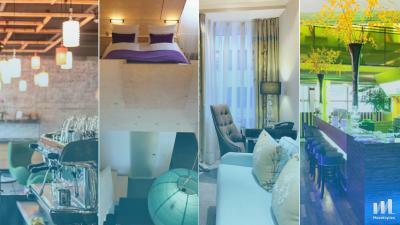 Integrated solutions such as the "YHotel" offer hotels more advantages. We know that good software relieves a team from a short-term perspective. YHotel optimizes guest communication and guest satisfaction from implementation. " The "YHotel" team relies on a flexible system architecture that can be built on an ongoing basis. The scalable SaaS solution has the advantage for the hotelier that functions can be easily installed over time. YHotel allows hoteliers to connect different systems. "For us from UpsellGuru this is a great way to develop a joint solution hand in hand. The partnership bundles a lot of know-how, but nevertheless ensures that everyone can keep their focus. We are seeing more and more the desire of the hotels for an integrated solution," says founder Karl Schmidtner of UpsellGuru. "We are sure that with this modular concept we will hit the nerve of the hotels. The technology landscape in the hotel industry is very rugged and not interconnected. However, the awareness in the hotels has grown extremely strong. Similar to IBM's first personal computer, the modular approach that made the PC cheaper and more intuitive was critical to its success. The YHotel Model 1.0 works on this modular concept. We provide the hotel industry with a concrete solution to close the patchwork of technology in hotels. We are convinced that hotels can now exploit the potential of digitization for guest satisfaction and customer service." Bastian Kneissl explains his vision. Bastian Kneissl won the Startup Battle at the German Hotel Congress & Hotel Expo 2019 in Berlin with his mission "why" hotels need a modular CRM system to combine the chaos with the many available tools and guest data in one solution. The award once again recognizes outstanding innovations and developments for the digitization of the hotel industry. "YHotell" Live demos at the ITB Berlin from 6th March to 8th March, every day at 11:30 am and 3:30 pm at the myLike booth 107 in hall 6.1. "YHotel" is the first marketing alliance for hotels. The five providers come together and merged their knowledge and expertise: Code2Order, MountLytics, MyLike, UpsellGuru and Selecdoo. The aim of the marketing alliance is to make the guest journey as personalized as possible from booking to departure and to offer the hotel a synchronized solution from a single source. Together, the partners already bring together over 1,000 hotel clients and years of experience in the hospitality industry. The combined know-how in the disciplines CRM, Data Management, Upselling, Affiliate Marketing and Progressive Web App Interfaces secured the "YHotel" solution the first place at the AHGZ Startup Battle of the German Hotel Congress 2019. With MountLytics, the guest data from the PMS is merged into a database. The guest profiles are classified in target groups and enable individual communication. http://mountlytics.com. Selecdoo is a platform technology that brings digital distribution partners together with tourism service providers. The aim of these corporations is to generate direct bookings in the hotel via the respective website. http://selecdoo.com. UpsellGuru is an up-selling system that allows hotels to offer guests room upgrades. This will intensify the stay and maximize up-sell. http://upsellguru.com. With myLike Mobile Concierge, hotels inspire guests with personal recommendations in their own environment. The tips can be used at any time on any device without download or login and can be found by GPS. http://mobiler-concierge.com. Code2Order provides an evolution of the classic digital guest folder, providing the right information at the right time, in the right place. The latest technology in the Progressive Web App brings all the information and services around the hotel to the guest device - without a classic app download. http://code2order.com. It is important to the team that digital guest communication and guest satisfaction are not isolated goals in hotel operations. Rather, the philosophy of a hotel determines the strengthening of the guest relationship. It is about a holistic strategy and not about stringing together individual measures. This includes harmonizing processes with the digital age, bringing services to an improved level, and offering completely new services to the hotel. By defining individual measures, the guest can be addressed at each point of the customer journey via "YHotel" and positive guest experiences can be created for the guest. This promotes the guest binding. More information on the trend-setting marketing alliance for hotels "YHotel" under yhotel.io.